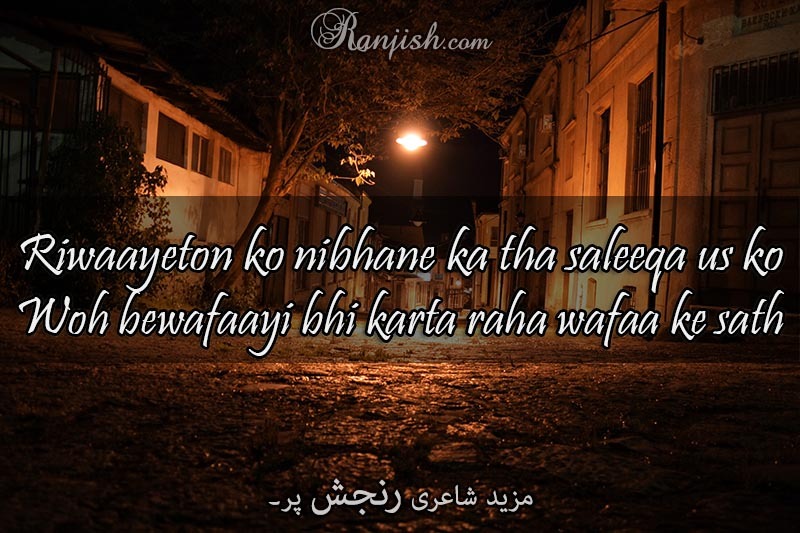 Ranjish.com has lots of Urdu Bewafa Shayari Poetry. Feel free to add your own Bewafa Shayari Shayari here. People dedicate Bewafa Shayari to the people who have ditched them and have cheated on them. Bewafa Shayari is one of the most read topic in Urdu poetry. Everyone knows that love hurts, but it hurts a hell more if someone cheats on you. Bewafa shayari covers all these topics. Riwaayeton ko nibhane ka tha saleeqa us ko. Woh bewafaayi bhi karta raha wafaa ke sath.. Band mutthi se girti huyi rait ki tarah..
Bhulaa diya tum ne to zara zara kar ke..
Haadsa yeh bhi qayamat se koi kamm to nahin..
Tu ne jo ranjj diye bhoolte jaate hain humain..
We update our poetry database on daily basis so keep coming back for more Bewafa Shayari.